‘makach al khamssa ya Bouteflika’ Wow! The demonstrations in Algeria are a breath of fresh air in the Maghreb. Women & children in the front rows. So far, so good. But the gangsters who have hijacked the country will not simply hand over the keys to the government (or to their bank-accounts into which the wealth of the country has been drained). 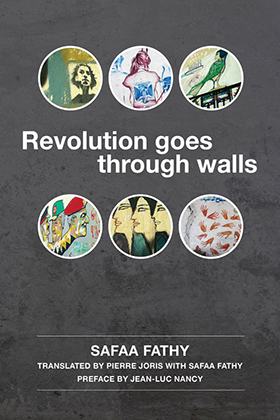 And it makes me go back to a book that came out last year, the Egyptian poet & film-maker Safaa Fathy’s Revolution Goes Through Walls, a collection of poems & texts I helped her translate into English (& that was published by Splitlevel — http://splitleveltexts.com/texts/revolution.html — & celebrates the Tahrir Square uprising in Cairo during that country’s “Arab Spring”). - Tell your feet that don’t want to go where you want to go that the journey is toward absence. - When the gas entered my lungs I decided to start smoking again. - The taxi driver took me as far as Al Abbassya and held his hand out to greet me. He and I are incidentals encountering each other in the space of a city, in 2011. He represented the Brothers and I, the others. - We wore masks to protect ourselves from the gas. We knew perfectly well that they were signs to recognize our faces while we marched. - On the Square an old man came toward me carrying a tray of “kushari.” I said to him: in the new constitution women have to be given all their rights. - When a young man’s cold hand grabbed mine as I entered the Square through the Talaat Harb barricade, I yelled at him and he let me through without controlling my national identity card number. - Each time I came through the Abdelmeneim Riad barricade, the young girl who body-searched me would say please forgive me, and I would forgive her immediately. - I stood behind a sheikh who was sermonizing on Tahrir Square. Each time he said something beautiful, I’d add: well said! Then he would say even more beautiful words. - Some men sat down on the sidewalk and wrote slogans on bits of cardboard. Exhausted, they wore the slogans on their heads like hats. - I entered the sentry box of a traffic policeman in front of the Ministry of Foreign Affairs. A history Professor, originally from the Delta, already sat there, resting from a night spent standing, securing the Square. - Each time I tried to photograph from on high, I took the place of some young man who helped me sit on top of the green barrier. - The young man who left me enough space to put a foot down on the roof of the Tahrir subway station in order to watch the speech of the ousted one on the 10th of the second month of the year 11, yelled: he still uses the future tense! I told him: you have become a symbol! - Two young men were listening to the speech of February 10, and their heads were so conjoined that I thought I was witnessing the emergence of a new human species. - On the Square I saw old friends I hadn’t seen for a very long time. Their eyes were bulging, red, their faces haggard. I understood that we had never met before. - I hadn’t thought it was a revolution until I heard a man of the people yell into his phone: I am not at a demonstration, I am in a revolution. - I saw a young man with a white bandage over one eye when I entered the field hospital on the Square. There was a piece of banana by his side, and a young girl who's asked me: Where from? - The night of the ouster I saw a blind young man carrying a tape recorder and a microphone. He was asking the passerby’s for their feeling in order to see them. - One evening the soldiers didn’t want a young man to accompany me on Kasr el Nile bridge. I threatened them: if I get killed I’ll come back to haunt you. Then they allowed him to accompany me. - I learned how to hitch-hike in Cairo on the evening of January 28. - On the evening of the Battle of the Camel, I was carefully proceeding toward Abdelmoneim Riadh Avenue. That’s when I saw Nassif, my friend from Paris, in the process of throwing a brick. I said to him: lend me your shoulder so that I may rest my camera on it.